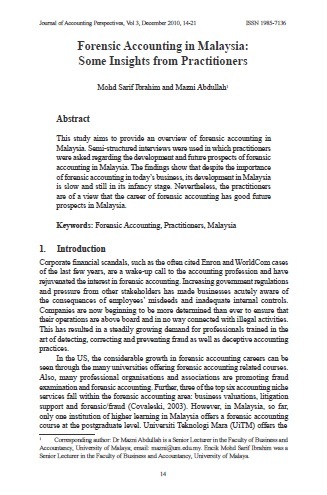 This study aims to provide an overview of forensic accounting in Malaysia. Semi-structured interviews were used in which practitioners were asked regarding the development and future prospects of forensic accounting in Malaysia. The findings show that despite the importance of forensic accounting in today’s business, its development in Malaysia is slow and still in its infancy stage. Nevertheless, the practitioners are of a view that the career of forensic accounting has good future prospects in Malaysia. IBRAHIM, Mohd Sarif; ABDULLAH, Mazni. Forensic Accounting in Malaysia: Some Insights from Practitioners. Asian Journal of Accounting Perspectives, [S.l. ], v. 3, n. 1, p. 14-21, dec. 2010. ISSN 0128-0384. Available at: <https://ajap.um.edu.my/article/view/3650>. Date accessed: 20 apr. 2019.